With all the features of MoneyWorks Cashbook, plus receivables and payables, MoneyWorks Express is the ideal accounting solution for the smaller business that aims to grow. Generate invoices and statements. Monitor amounts owing and get notfications of overdues. Create eye-catching invoices, statements, PO's, mailing labels & remittance forms. Full payments history, as well as automatic notification when creditor invoices overdue. The accounts receivable efficiently tracks your invoicing who owes you money, enabling you to reduce outstanding invoices for better cash flow. Produce free-form service invoices or quantity/item invoices with descriptions of up to 1000 characters per line item. Subscription billing: Replicate an invoice multiple times for selected customers (membership dues, school fees, subscriptions etc). Recurring invoices (e.g. retainers) can automatically regenerate at nominated intervals. Head office billing and drop shipping: sell to a branch office, but bill to head-office. Offer and manage prompt-payment discounts, to speed up collection. Manage GST/VAT/sales taxes, with tax overrides for overseas/out-of-state customers. Use the built-in forms designer to customise your invoices (and statements) to represent your company brand. Easily manage/sort/search your receivables with the configurable onscreen list. Print or email statements and overdue letters, either individually or in bulk. 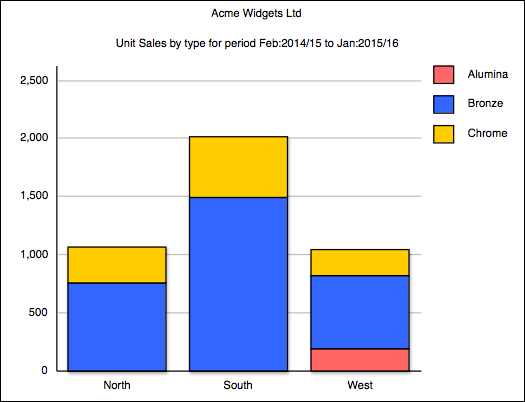 Customisable open-item or balance-forward statements forms. Automatic notification of overdue accounts for good debtor control. Variable credit terms and limits, and hold facility for delinquent customers. Flexible ageing with comprehensive reporting to meet with your billing cycle. Fast on-screen customer payments history to see who paid what, when. .. and allocate customer payments, even when they botch it. Fast processing of receipts either individually or in batch. Open-item receivables with optional smart auto-allocation of receipts to invoices. Allocate receipts to invoices when importing bank statements. Easy write-off, contra and cancellation facilities. Handles partial payments, overpayments and uneconomic balances. Use the accounts payable system to optimise your payments for better cash flow. Fast, streamlined entry of supplier/vendor invoices. Import electronic invoices using configurable import maps. Record invoices by item or by account. Prompt-payment discounts - take advantage of any supplier prompt-payment discounts (and correctly account for GST/VAT/Sales Tax). Head-office payments: purchase from branch but pay head-office. Also suitable for co-ops. 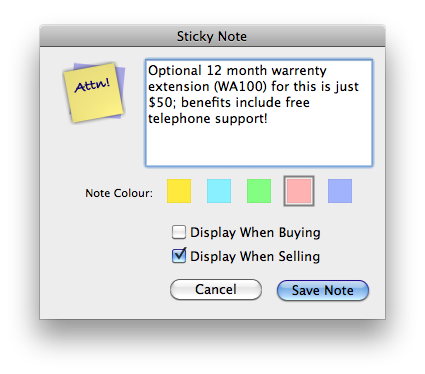 Automatic notification when payment on invoices is overdue. Fast and comprehensive on-screen payments history, to see what you paid and when. Aged payables reports, including retrospective. Batch payments: pay hundreds of suppliers in a single payment run. Associate creditors with a payment method to easily select and pay by cheque, direct credit etc. Print cheques and/or remittance advices, or email remittance advice direct to supplier. Prepare direct credit schedules for electronic submission to bank1. 1Electronic payment is for supported banks only (most NZ, Aus banks supported) and may require special bank software. New banks can be added as MoneyWorks report plug-ins. 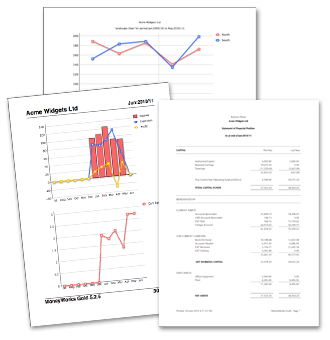 Your MoneyWorks file contains much more than just financial data, so we make it easy for you to analyse this to get better insights into how your business operates. 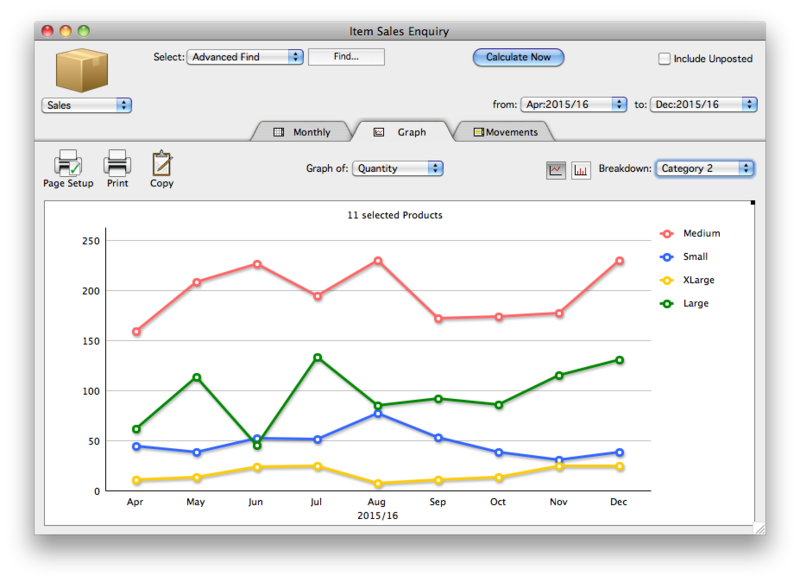 All MoneyWorks products include a number of standard analysis reports (such as "Item sales by customer"). These can be easily modified in MoneyWorks Express/Gold, or you can create your own from scratch. Flexible, user-specifiable analysis reports perform powerful cross-tabulation dissection of your sales and/or purchases in up to three dimensions over a nominated time range. Easily answer questions such as "who is buying these products?" and "what products did we sell into this region last quarter?". Analyse by dollars, quantities, costs or margins. 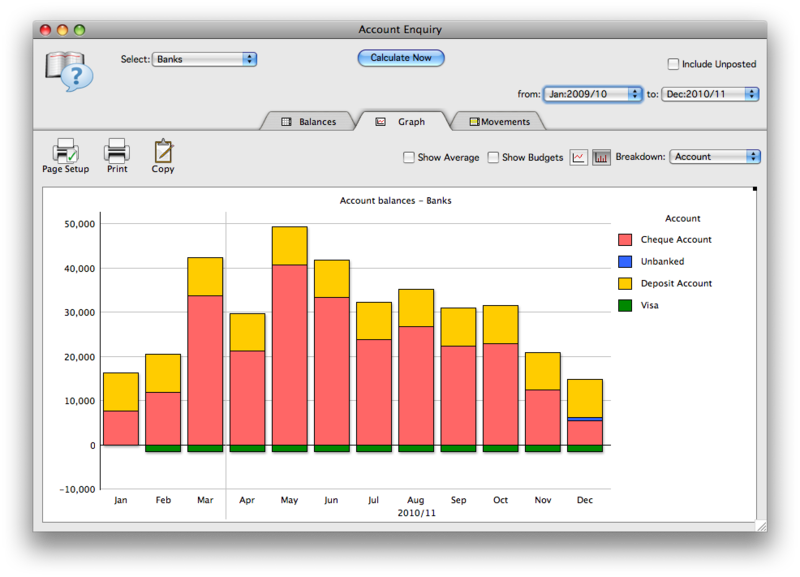 Prepare tabular reports with live drill down, or present as charts (column, stacked-column, line or pie charts). 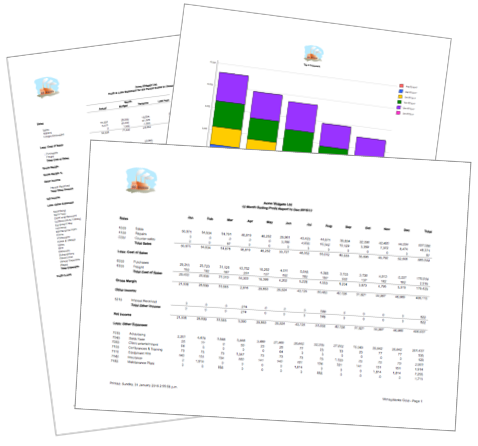 Save analysis report templates for reuse later. Easily email report outputs as pdfs. MoneyWorks Gold/Datacentre also includes analysis of job data (e.g. "what resources have been used on this job? ", "on what jobs has this resource been used? ", "what has Grant been doing?"). Create eye-catching invoices and statements, not to mention purchase orders, cheques, mailing labels and remittance forms. Fit forms to existing stationery or print on plain paper. Full graphics support for company logos, etc. Design your own invoices, statements, receipts, cheques, letters, product labels etc. Include graphics—lines, rectangles, round-cornered rectangles and pasted/imported graphics. Create multi-part and multi-page forms. Easily print mailing labels, product labels and shipping labels. Include barcodes (EAN13/UPC and GS1/Code128) and product images. 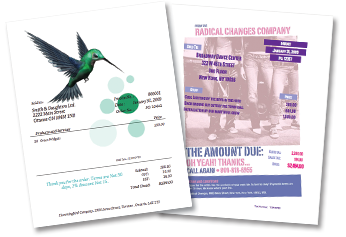 MoneyWorks comes with dozens of standard forms. With MoneyWorks Express or MoneyWorks Gold you can modify them or create your own. MoneyWorks Cashbook can use forms designed with Express or Gold. Good management of your receivables (who owes you money, also known as your debtors) is a vital part of running any business, and MoneyWorks makes this easy. Being able to generate professional looking invoices is just the start of the process—you want your customers to pay as soon as possible. With automatic reminders, easily searchable lists, special enquiry screens and credit hold facilities, MoneyWorks gives you the tools you need to better manage your receivables and improve your cash flow. MoneyWorks Express also includes features that you would normally only find in higher-end systems with higher end pricing. Features like time-expiring (prompt payment) discounts, head office billing (where you invoice the branch, but get paid by the head office), subscription billing (send the same invoice to hundreds of customers), and customisable over-due letters which can be printed or emailed. Note that, if you want to segment your general ledger with multiple accounts receivable control accounts, or to send invoices and receive payments in different currencies, you will need to consider MoneyWorks Gold. Careful management of your payables (the businesses that you owe money to, also known as your creditors) can improve both your cash flow and your credit rating. MoneyWorks has the tools to manage this process, and to take advantage of any prompt payment/settlement discounts offered by your suppliers. MoneyWorks also makes the payment process easy, with the ability to pay your creditors individually or in bulk, either by cheque or electronic payment (for supported banks) with email notification. Note that, if you receive and pay invoices in different currencies, you will need to consider MoneyWorks Gold. One of the many features that sets MoneyWorks apart from other systems is its ability to number-crunch your data to produce management insights into how your business operates. You've got all this valuable sales and purchasing data in your system, and unlike other systems, MoneyWorks lets you analyse it easily. The built-in Analysis Report generator allows you to easily specify the data you want to analyse, and will produce a simple table or graph for the desired time interval. Then you’ll need to consider MoneyWorks Gold or Datacentre. MoneyWorks Gold includes all the features of Express, plus full inventory control, job costing, foreign currency support and more. MoneyWorks Datacentre has all the features of MoneyWorks Gold, with the convenience of server hosting. Allows any (authorised) user to access any MoneyWorks file at any time. Access MoneyWorks from mobile devices (iPad, iPhone, Android etc).